Planning permission in principle has been granted for a “new town” development including almost 2,000 new homes at Old Craighall, Musselburgh, east of Edinburgh. East Lothian Council has approved two planning applications by Persimmon Homes for more than 116 hectares of land surrounding Queen Margaret University, south of Musselburgh. “The application for the mixed use development at Old Craighall, as allocated in the Local Development Plan, was submitted following community consultation, including a public event at The Brunton, Musselburgh,” said East Lothian Council. 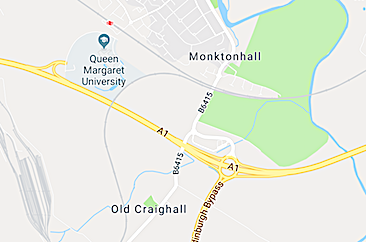 “The total site is 116.5 hectares and refers to land around Queen Margaret University (QMU) and Musselburgh railway station and to the north and south of the A1. “The plans include improvements to the junction off the A1 at QMU as well as the creation of pedestrian and cycle routes, including the council’s Segregated Active Travel Corridor. “The Innovation Hub at Queen Margaret University is part of the multi-million pound Edinburgh & South East Scotland City Region Deal, which will contribute to the joint development between East Lothian Council and QMU. “The hub will facilitate an expansion of the university’s existing Scottish Centre for Food Development and Innovation and will also provide flexible commercial space for small and medium sized businesses in the food & drink sector. “Council officers had recommended granting of permission in principle for the two applications with conditions and a Section 75 agreement to fund transport infrastructure improvements, contributions for the new primary school and for secondary education provision and for community pitches. Planning committee members unanimously agreed to approve both applications.